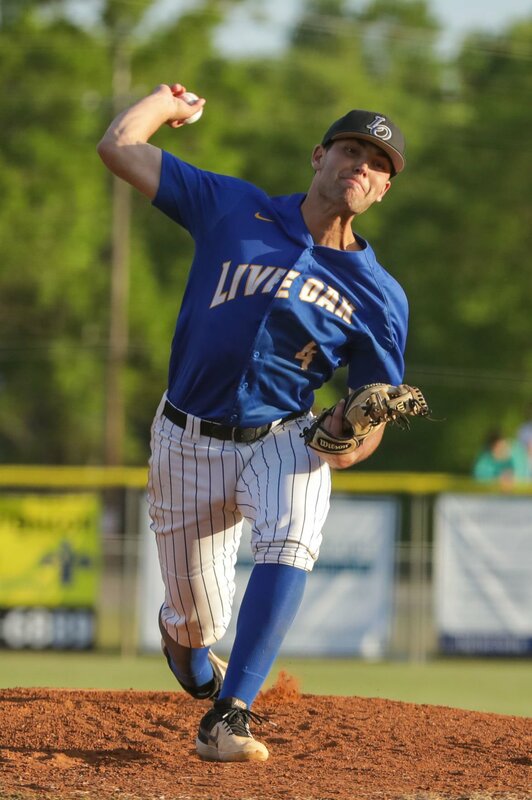 Live Oak's Sal Palermo (4) was the winning pitcher for the Eagles. Denham Springs High's Tyler Evans (5) runs down the first-base line. Denham Springs High first baseman Brennan Hall (31) follows through on a pitch. Live Oak first baseman Brant Smith (23) celebrates his home run with Kody Guidry (6) in the fourth inning. Denham Springs' JT Gould (15) came in relief in the fourth inning. Live Oak third baseman Lane Hutchinson (11) looks for the ball as a Denham Springs High baserunner slides. Denham Springs High catcher Tristan Duhe (10) looks in a pitch with Live Oak's Kody Guidry (6) batting. Live Oak pitcher Sal Palermo (4) charges down the first-base line. Denham Springs High Tyler Evans (5) pitched into the sixth inning for the Yellow Jackets.